So I got Pokemon X for christmas last year (OH got Y) which brought out my pokemon love! 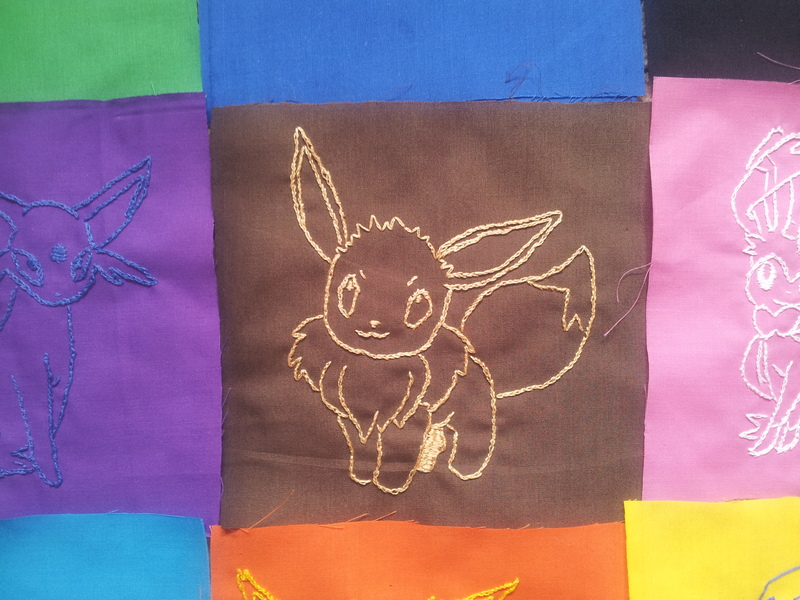 The best bit is that they’re released a new Eeveelution – Sylveon. 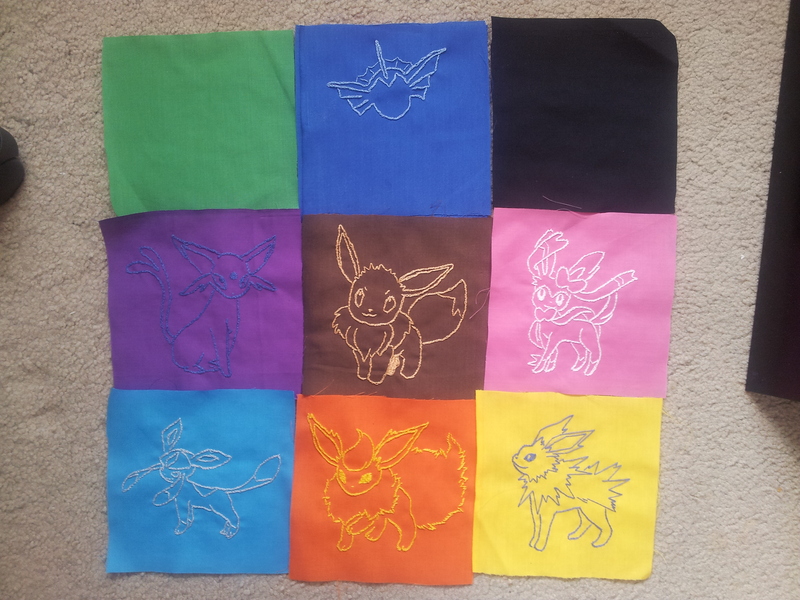 This means there’s now 9 Eeveelutions… so of course my brain thinks, “Hmm that would be a perfect patchwork cushion!” I tried to match the fabric and the thread to the pokemon. 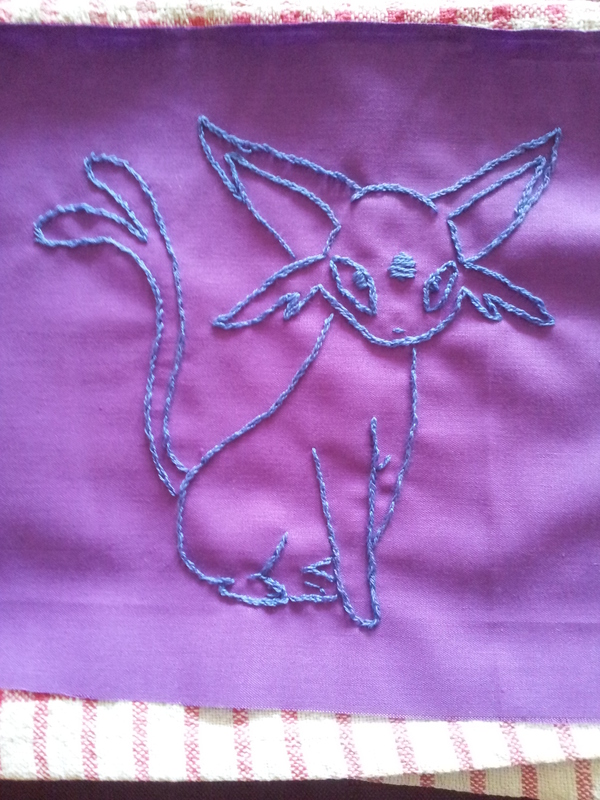 I completed Espeon, Jolteon and Glaceon last January, but lost interest and did some cross stitching instead :$ I picked it up again recently and here’s what I have so far! Here’s them all together. I’m trying to find the best combination of colours so it’s not fixed yet. 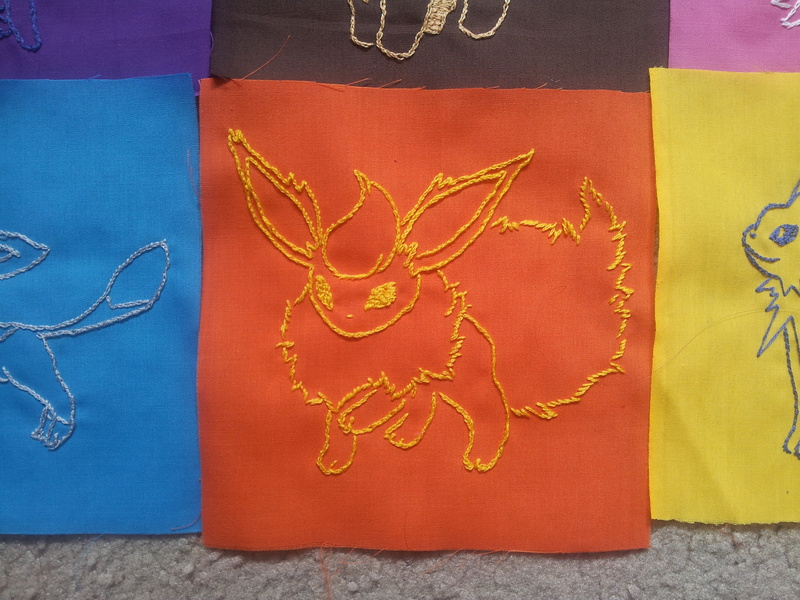 Just working on Vaporeon up the top. So we’ve both pretty much completed Black and White to a reasonable level now… ie Elite 4 are done and we are both Champions of our respective regions!! Pokedexes are nearly full (and the national dex is coming along too!!). So he got bored and ordered Diamond and Pearl! The idea was that they were the most recent, reasonably priced games. They’re for DS so they go straight in! First impressions are that it’s annoying in a lot of ways. I’m not too bothered about the Pidgeys and Magikarps, because it’s been a LOOONG time (well, 5/6 years) since I played Red. The pokedex is also integrated anyway since they’ve added evolutions and ‘prequels’ all over the shop. There’s also the beauty contests and 6(?) HMs. Still, it’s fun to play and not much new to learn. Bulbapedia is extremely handy, since there’s crazy evolutions here. Stuff like having happiness in the day or at night… then there’s a pokemon which evolved into one of 2 things at random. It doesn’t feel like cheating since this is an awkward and older version, and we only check evolutions anyway. So far, the gameplay is surprisingly non-linear. The next way to go is not always obvious, and not every single route is blocked off if you haven’t completed your next task! So here’s my current project! 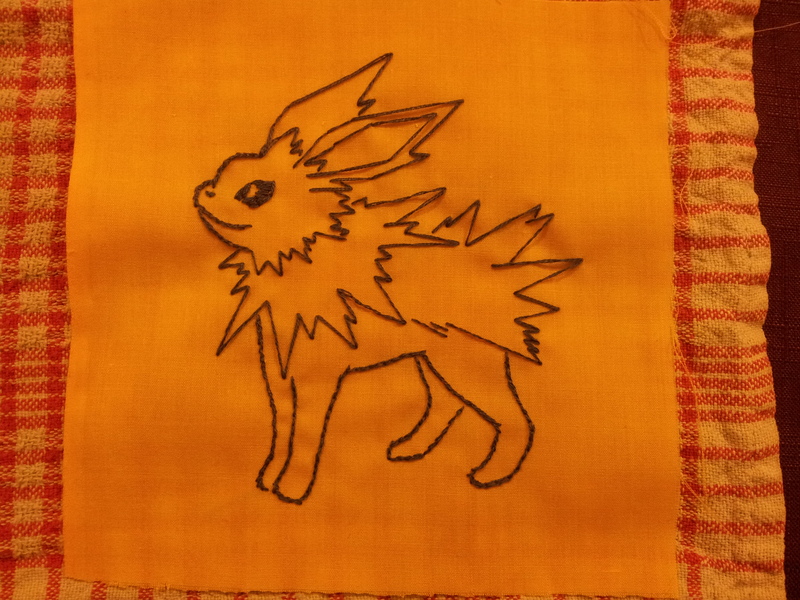 I’ve been working on it for a while now actually, and surprise surprise, it’s based on Pokemon!!! 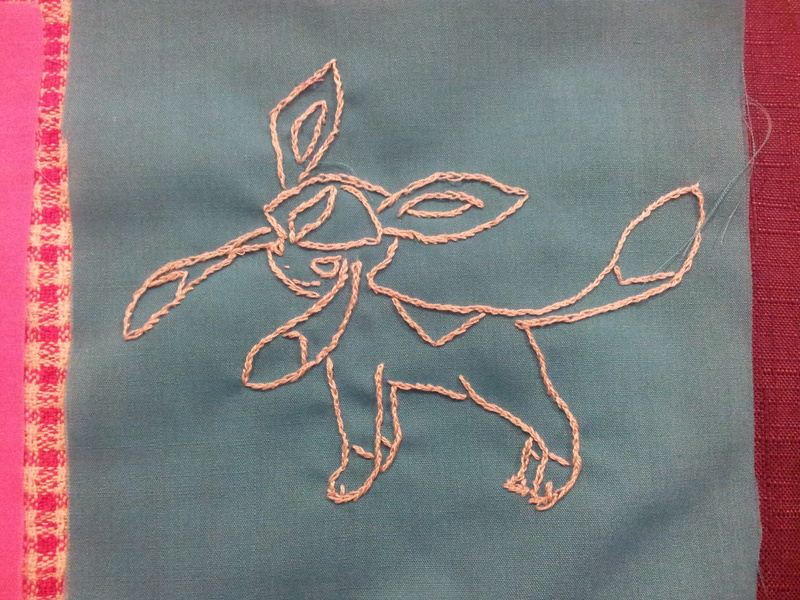 I basically took an old frame and measured it to work out the number of stitches that would fit on my count of aida. 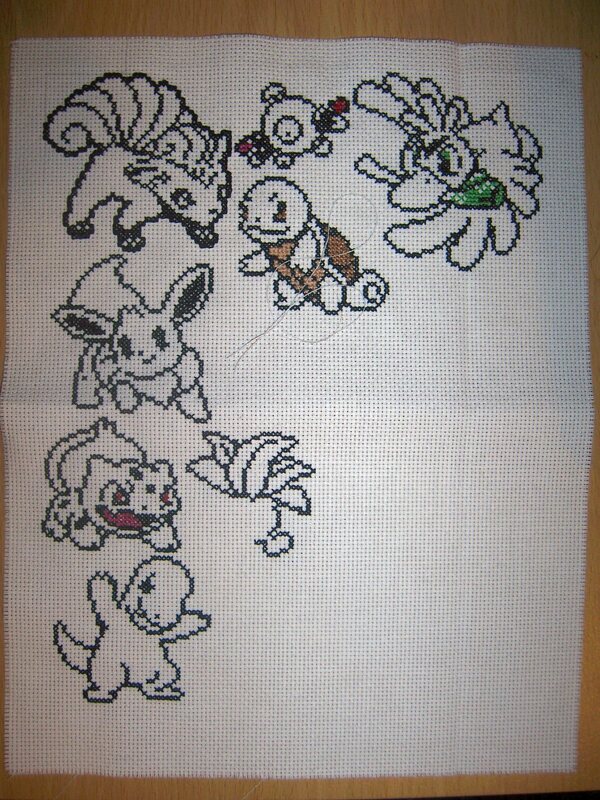 I then made a Paint image using the number of stitches as the number of pixels, and fit the pokemon sprites into the blank image. 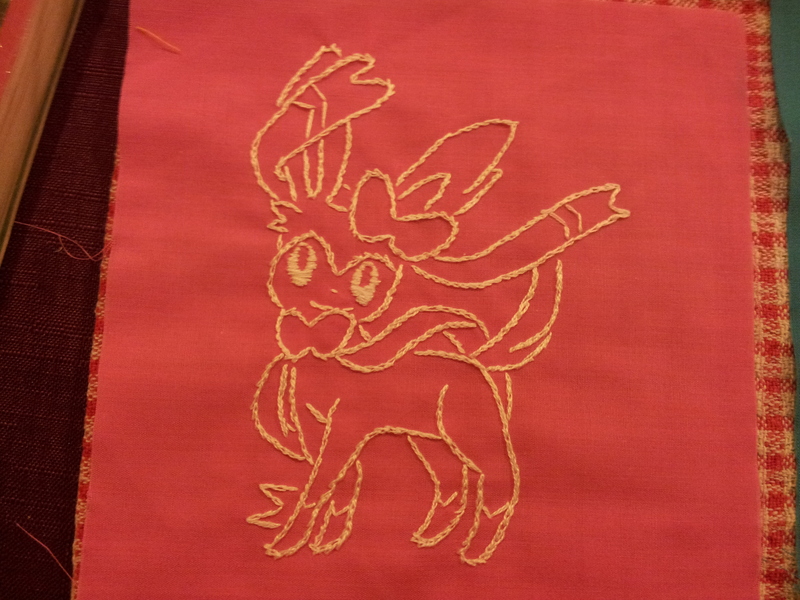 The pixels are one stitch each so it works out as a perfect sizing method! So on Saturday we got Pokemon Black and White. Black for me, White for him. I have just lost the last 2 days entirely! Honestly, it’s an amazing game. I’ve only ever played Red version, and dabbled a bit on my brother’s Crystal. I never got into the last 3 versions since you had to catch magikarps and pidgeys, and all I wanted to do was to catch the new pokemon! Well in this version all my wishes came true!!! It’s a completely new game, with a new pokedex!! No more Pidgeys!!!! Game-play wise, it’s pretty identical to the origianl Red/Blue versions, with the best bits from the later stuff (like items and breeding) and the worst bits taken out (like bicycle gears and crazy evolution requirements). Plus, when you defeat the Elite Four new regions open up and you get ‘outbreaks. In the new regions you can catch the pokemon from the older versions if you’re that way inclined. Win win!!! !